SAML (Security Assertion Markup Language) is an XML standard that allows secure web domains to exchange user authentication and authorization data. You can configure Tableau Server to use an external identity provider (IdP) to authenticate users over SAML 2.0. No user credentials are stored with Tableau Server, and using SAML enables you to add Tableau to your organization’s single sign-on environment. Server-wide SAML authentication. A single SAML IdP application handles authentication for all Tableau Server users. Use this option if your server has only the Default site. In addition, if you want to use site-specific SAML, you must configure server-wide SAML before you configure individual sites. Server-wide local authentication and site-specific SAML authentication. In a multi-site environment, users who are not enabled for SAML authentication at the site level can sign in using local authentication. Server-wide SAML authentication and site-specific SAML authentication. In a multi-site environment, all users authenticate through a SAML IdP configured at the site level, and you specify a server-wide default SAML IdP for users that belong to multiple sites. User authentication through SAML does not apply to permissions and authorization for Tableau Server content, such as data sources and workbooks. It also does not control access to underlying data that workbooks and data sources connect to. Note: Tableau Server supports both service provider initiated and IdP initiated SAML in browsers only. Connections from Tableau Desktop or the Tableau Mobile app require that the SAML request be service provider initiated. 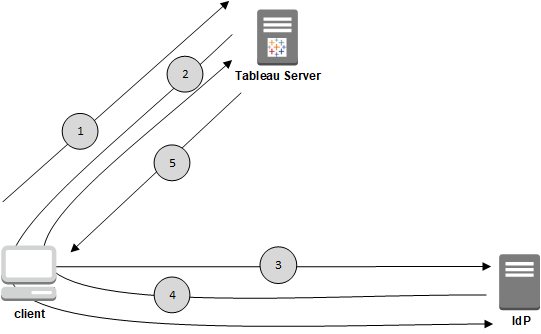 User navigates to the Tableau Server sign-in page or a published workbook. Tableau Server starts the authentication process and redirects the request to the registered IdP. The IdP requests the user’s username and password and authenticates the user to the IdP. The IdP returns a SAML success response to Tableau Server. Tableau Server verifies that the username in the response matches what is stored in Tableau Server and displays the page the user requested in Step 1.